There is no dearth of real life adventures when it comes to India tourism. 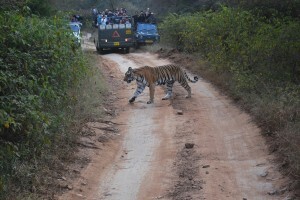 If you are not extreme thrill lover, you can try out jeep safari in India. This is one such activity that I love to go for, especially in the popular wildlife sanctuaries in India and the classic hilly terrains. While going through the Indian travel guide a few days back, I observed a number of such places. Whether you want a closer look at wildlife or the dense greens or even the less accessible hills, jeep safari tours are incomparable. But to enjoy these exciting rides, it is advised to hire a trained guide, especially for the wildlife region and the hilly terrains. A guide not only helps you move on the safe route but also suggests about the important things to carry. So whenever you plan out for a jeep safari tour in India, just go through the Indian tourism guide book. It will help you find out the unique aspects of India that you have read in the books or just seen on television. Once you opt for this mode of exploring tourist places in India, you will surely surrender your soul to incredible India tourism.